I’m lucky to call Kelly (@kmktaylor) my neighbor*, and not only because she is a talented baker who likes to share treats. Kelly and her husband (who is also Mark’s running partner) have 2 of the most adorable girls (with a 3rd on the way) and she is always in the know about what is going on for kids and families in our neighborhood and beyond. When Kelly asked if she could guest-post about her experience at Goldfish I was happy to oblige. We’ve been fans and members of Goldfish since they opened and I think it’s good to hear another perspective – especially from a parent of younger kids. Disclaimer: Kelly’s family was given a month of free lessons in exchange for a review of their experiences at Goldfish Swim School, where they were already long-time paying members. As always, all thoughts are 100% personal. It has been a year and a half since we began at Goldfish Swim School. Not really knowing what to expect from a swimming pool dug into an office building, we were pleasantly surprised with our initial experience and have been singing Goldfish praises to our friends and neighbors ever since. The first thing you notice at Goldfish are the facilities. Hands down, they are the cleanest pool facility catering to little ones we have ever seen. No details were spared, from the immaculate changing rooms to the hair drying station, to the Bumbo seats, a spare bucket of diapers (yes, we have borrowed from this!) and high chairs. There are books, chalkboards and a fish and turtle tank to keep kids occupied while waiting on their lesson. They truly thought of everything when designing the facility. One of our favorite aspects of Goldfish are the perpetual lessons – all year round, same day, same time. When trying to juggle the lives of young children, having a consistent routine makes things that much easier. At Goldfish, you do not have to worry about signing up for sessions, because unless you request a time change, the lesson time will never change. Not to mention, our kids are excited and look forward to their lessons each and every week. If for any reason you have to reschedule a lesson, it is very easy to call and multiple times are offered for each level every week. We have never had a problem completing a make-up class. Having weekly lessons has also allowed us to witness firsthand the progress our daughters have made in terms of developing certain skills and overall confidence in the water. It is amazing to watch your child master a skill they have been working toward! The entire staff in the pool is extremely supportive and constantly encouraging the children to do the best they can. Not to mention, when out of the pool, the staff is friendly, smiling and always ready with a high five! It may not seem like much, but we also value the fact that almost every staff member, not just their teachers, greets our children by their name. It shows they care, pay attention and respect our family. Admittedly, the cost of lessons can seem daunting, but we feel that learning how to swim and be safe around water is an important lesson our girls need to know. A weekly lesson, and not just a few classes taken over the summer, along with family open swim times at Goldfish have proven to be well worth it for our family. 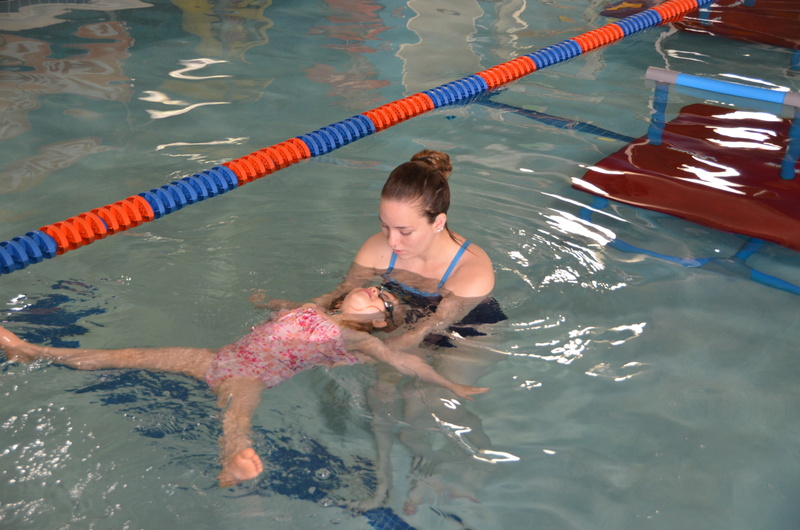 Our experience at Goldfish Swim School has been great, and we hope to continue it going forward. *Funny story about how Kelly and I met: we were connected on Twitter and both knew we lived in the same town. One night she and I both tweeted about a loud party with a live band going well into the night. A few direct messages later and we learned that we live about 12 houses apart! Note: I got nothing for posting this. I was happy to give Kelly a place to show her love for Goldfish since we’re always getting questions about why we love it, too.